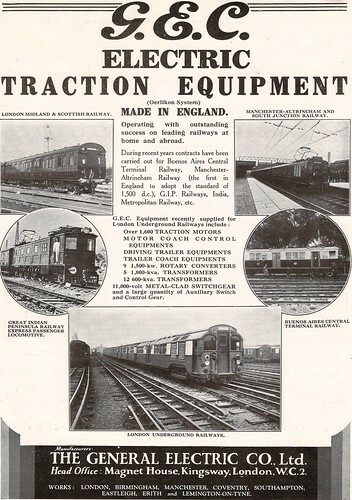 GEC manufactured the bulk of the traction equipment for the "standard" tube stock built in the 1920s and ’30s – as seen here. The other undertakings shown are the London Midland & Scottish Railway, the Manchester, Altrincham & South Junction Railway, the Great Indian Penisular Railway and the Buenos Aires Central Terminal Railway. This entry was posted on Sunday, August 19th, 2012 at 4:02 am	and is filed under Electric Trains. You can follow any responses to this entry through the RSS 2.0 feed. Both comments and pings are currently closed. This page took 0.417 seconds of computer labor to produce.